It is officially springtime, and the sun is out and the birds are chirping. When winter ends, so does a long hibernation. All of a sudden, people want to come over and be social. And, you don’t know what to feed them. Well, vegan party dips are my specialty. They are quick and easy, and they taste absolutely delicious. Why vegan dips? A lot of people have food sensitivities these days, and excluding dairy can allow everyone to enjoy. But, make no mistake vegan dips have plenty of flavor and delicious ingredients. Trust me; everyone will approve. Here are five of my favorite dips that will be sure to complement any get-together, especially for this spring. This artichoke leek dip is my go-to dip for most get-togethers. It is thick, creamy, garlicky, and downright artichokey. All right, so I made that last word up, but the artichokes taste incredible in this dip. I also add a bunch of herbs and spices, and voila, you have an addiction. Just kidding, but seriously though, you will love it. The artichoke leek dip just goes with everything, including flax crackers, tortilla chips, vegetables, and flatbread. Also, I don’t think it will last that long, but it will keep for about four days in the fridge in a tight-sealed glass container. For the dip base, blend water, lemon juice, salt, and cashews in a high-speed blender for 30 to 60 seconds, or until it is very smooth and creamy. In a pan, heat some olive oil and add the garlic cloves. Stir often and make sure the cloves do not burn. Sautée for about five minutes, until the cloves have slightly browned. Remove the pan from the heat, and put the garlic cloves into the blender. Trim the tough green leek ends off and discard. Slice the leeks lengthwise. Place them in a colander, and rinse under running water. Separate each layer with your fingers, and rub away the dirt or grit. Pat them dry with a towel, and slice them width-wise. Return the pan to medium heat, and add some olive oil and the leeks. Sautée them over medium heat until the leeks have softened and become fragrant. It will take about seven to 10 minutes. Then, add the leek with the garlic in the blender. Add all the remaining ingredients into the blender, including the artichokes, vinegar, parsley, dill, and garlic powder to the cashew base. Pulse until well combined, and most of the garlic and artichokes have been broken up. You can pulse the dip until completely smooth, or leave it with some bits of artichoke. Taste the dip, and add more seasoning as needed. Enjoy! Nothing says spring like fresh herbs, especially basil, dill, and garlic. I like to put all of them into a dip whenever I can. Again, cashews make for a good dip base and have a lot of nutrition. Cashews are packed with protein, healthy fats, vitamin K, and lots of minerals. The combination of cashews and nutritional yeast make for a slightly cheesy flavor, and the addition of dill and basil adds a welcomed pleasant taste of fresh herbs. And, no…you really can’t get enough of fresh herbs. This cashew cheese recipe will last a few days in the fridge. In a high-speed blender or food processor, mix all ingredients until the dip is well combined. If you want a thinner cashew cheese dip, add another tablespoon of water. Serve with your favorite crackers or veggies, such as carrots, celery, or cucumber. You can use this tapenade recipe as a salad dressing, pasta sauce, or as a great dip for veggies and crackers. It’s your choice. You can also marinate your favorite protein, including fish, chicken, or even tofu. The combination of black olives and sun-dried tomatoes will be your new favorite thing. As a bonus, the olives are full of cancer-fighting phytonutrients that also support the digestive, nervous, respiratory, and cardiovascular systems. The bottom line is that this dip is good, and you (and your friends) will certainly enjoy it. The recipe will yield about one and a half cups, and whatever you don’t finish should last a day or two in the fridge. Place all ingredients in the food processor, and process until combined and slightly chopped, but not pureed. You want to maintain a little texture. Place the dip in a bowl, and enjoy with your favorite crackers, chips, or vegetables. I remember polishing off a whole onion dip with chips when I was younger. Yeah, not my finest hour. But, it did make me wonder what a good onion dip replacement would be! An onion lentil dip is certainly something to be desired. It is also full of nutrients from whole foods, and not from processed sour cream and an onion mix. Onions are packed with immune-boosting allicin, along with potassium, quercetin, and fiber, which all help to expel toxins from the liver. And, the lentils also provide some protein and iron, which are great for building muscle. This lentil onion dip will last up to four days in the fridge. If using dried lentils, place them in a small pot with the water and bring to a boil. Reduce the heat and simmer for 45 minutes. Drain well. In a skillet over medium heat, cook onions in the coconut oil for five minutes, or until soft and translucent. Transfer the onions and cooked or canned lentils to a food processor, and add the rest of the ingredients. Process for five to seven minutes, or until it is extra creamy. Serve immediately, or store it in a Mason jar in the fridge. Yeah, it isn’t a list of dips without guacamole. Believe me, I tried to pick a different dip, and I couldn’t do that to you. Some may feel that guacamole is a dip blogged about far too many times to count. Although that may be so, guacamole is far too delicious not to mention over and over again. If anything, the following is a guacamole recipe to remind you to make some more guacamole. And, for the purpose of being different, this guacamole recipe adds a few anti-inflammatory spices, including turmeric, cumin, and chili powder. Enjoy it anytime you want. But, having said that, guacamole is often best the day you make it, so make sure everyone finishes it off. In a food processor or high-speed blender, combine avocado, lemon juice, olive oil, avocado oil, sea salt, cumin, chili powder, turmeric, cayenne pepper, tomato, garlic clove, garlic powder, red onion, green onion, and cilantro. Pulse until the guacamole is nice and smooth. Place it in a bowl and cover it with plastic wrap. Allow it to sit at room temperature for about two hours before serving. What is your favorite party dip? Dips are delicious, especially when homemade. 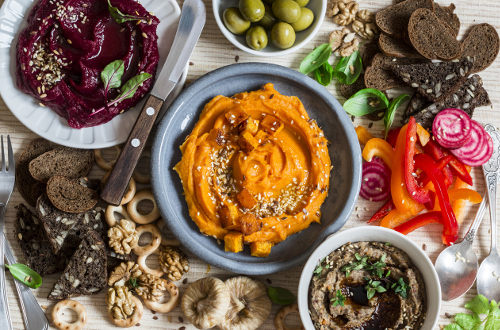 The healthy vegan dips in this article provide a great starting point for your next get-together this spring. The guacamole, olive and sun-dried tomato tapenade, onion lentil dip, cashew cheese dip, and artichoke leek dip will also give your guests something to talk about. I’m sure their taste buds will thank you. “Creamy Basil Parsley Dip,” Gourmande; http://gourmandeinthekitchen.com/creamy-basil-parsley-dip/, last accessed April 27, 2017. Telpner, M., The UnDiet Cookbook (China: Random House LLC, 2015), 98. Daniluk, J., “Hot Detox: A 21-Day Anti-Inflammatory Program to Heal Your Gut and Cleanse Your Body (Toronto: HarperCollins Publishers Ltd., 2016), 253. “Creamy Garlicky Artichoke Leek Dip,” The Good Karma Kitchen, November 3, 2011; http://thegoodkarmakitchen.blogspot.ca/2011/11/creamy-garlicky-artichoke-leek-dip.html. Bauer, E., “How to Make Perfect Guacamole,” Simply Recipes; http://www.simplyrecipes.com/recipes/perfect_guacamole/, last accessed April 27, 2017.